I love to paint snow! In no other format does an artist get to paint such vivid contrasts between light and dark or cool and warm. Even in the snow texture itself, I paint vibrating and contrasting colors in the snow. If you look closely, you will see pink and green, peach and blue, yellow and violet - all contrasting colors that cause a visual vibration effect, giving the snow the illusion of depth and icy-ness. 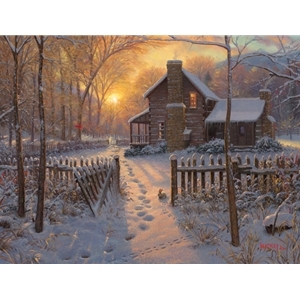 Welcome Winter is the final of four in a series depicting this old home place cabin in the four seasons, and is my favorite of the four. The warm glow of the sun in the back ground casts angular streaks of light that draw me in and make me want to go knock on the door. The fireplaces are roaring to fight back the cold, and the neighbors are sure to invite me in, because that is what friendly folks do. The delight of visitors around hot coffee and the breakfast table is much more invigorating than a TV show, and besides, they left the gate open as if to say "Welcome." So feel the draw and be compelled to spend some time with someone different, someone alone, someone with a soul that matters.